Although this restaurant is located in Thornhill, where parking is usually ample and never a problem, it has the WORST parking accomodation as it shares a lot with the apartment right behind it, another restaurant and I cant remember what else in the plaza. We had to circle the restaurant 3 times and still not find parking, so we ended up parking on the street nearby. Although we made reservation, I think we still ended up waiting for like 45mins before we were seated. The decor and service in the restaurant were okay, but definitely disappointing for a restaurant charging 30+ dollars for a dish. However, the dishes themselves were rather enjoyable. The black cod dish was cooked perfectly, and the miso and maple gave it a nice touch of sweetness and crunchiness. The spaghettini was good also, the scallops cooked perfectly. Overall, I think this restaurant is great with seafood. The dessert was probably the best part of the meal. I cannot remember what this dish was called, but it was definitely impressive when it was placed on our table. Initially, I wanted to order another dessert dish (because I saw someone else having it and I thought this was the one), but getting this dish was still a wonderful mistake. 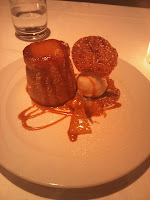 The cake was warm and fluffy... totally amazing.. and it had this caramel crisp thing... that looked so pretty. Overall, the food was good at this restaurant but pricy.